Known as Florida State’s most vocal leader while being a huge component to the program’s run to the NCAA Elite Eight in 2015…Her lone playing season at FSU occurred in the 2014-15 year and she made a huge difference as the team’s starting point guard/shooting guard…One of the most impactful transfers in the nation during her lone playing season…One of the quickest players Coach Sue has ever coached who helped make FSU one of the nation’s best fast-break teams in the country…Despite playing one year following a transfer from Kentucky, her 68 3-point field goals made ranks as the third-most at FSU in a season…Gave the Seminoles arguably their most important play of the 2014-15 season, preserving a 66-65 win over Arizona State in the NCAA Sweet 16 by making a steal just past half-court as the Sun Devils tried to win the game in the closing seconds. Led Florida State with 27 double figure scoring games…Became just the ninth Seminole to make 50+ 3-pointers in a season…Her 68 3-point field goals ranked third on the FSU single-season list…Made multiple 3-point field goals in 20 of her 36 games played…Ranked in the Top 10 in the ACC in assists per game (10th – 3.1) and 3-point field goals made per game (T-8th – 1.9)…Scored in double figures in 13 of 16 ACC games, including 11 of the last 12 games played…FSU’s team leader in minutes per game (30.1), steals (55) and 3-point field goals (68)…Had 18 games with a positive assist/turnover ratio…Scored in double figures in her first eight games played at Florida State…Made four or more 3-point field goals in six games, including four games against ACC opponents…Averaged 11.5 points, 1.8 rebounds and 3.1 assists…Shot 40 percent (152-of-380) overall and 36 percent (68-of-189) from long range…Had a game-high 19 points (7-of-12) in her Seminole debut against UAB (11/14/14)…Her 19 points scored was the most by an FSU guard in a season opener since the 2001-02 season opener…Named to the Cancun Challenge All-Tournament Team after leading Florida State in scoring average (13.0), 3-point field goals made (7), total assists (12), total steals (10) and minutes per game (30.0) over a three-game span…Tied career high with 19 points and nailed career-best five 3-pointers in overtime win at Purdue (12/3/14)…Scored 12 points in 28 minutes in a dominant victory over in-state rival Florida (12/7/14)…Tied career high at FSU with five assists against Temple (12/14/14)…Added 10 points in a home win over North Florida (12/16/14)…Had 12 points and three assists against Jacksonville (12/19/14)…Recorded eight points and three assists at No. 4/4 Notre Dame (1/2/15)…Career-high 20 points with four made 3-pointers and six made free throws at Clemson (1/8/15)…Had 13 points, four 3-pointers and five assists against Duke (1/11/15)…Recorded 12 points (3-of-7 on 3-pointers), three assists and two steals (1/18/15)…Team-high 17 points (3 treys) against No. 4/4 Louisville (1/22/15)…Totaled 11 points on 4-of-8 shooting against Wake Forest (1/25/15)…Career-best five assists along with 12 points at Georgia Tech (1/30/15)…Scored 10 points and had two assists in a home win vs. Syracuse (2/2/15)…Scored 13 points and added a career-best two blocks against Miami (2/8/15)…Career-best seven assists with 12 points and great individual defense at Virginia (2/15/15)…Had 18 points (4-of-8 from 3-point range) along with six assists at Boston College (2/22/15)…Team-high 17 points with four rebounds and two assists at Miami (3/1/15)…Generated 11 points and three assists vs. Virginia Tech (3/6/15)…Recorded two huge 3-point field goals and finished with 12 points against Louisville (3/7/15)…Had 14 points and dished out six assists against Notre Dame (3/8/15)…Had 16 points and five steals vs. Alabama State (3/21/15)…Had 11 points and three assists vs. Arizona State (3/27/15) in the NCAA Sweet 16, including the game-ending steal that sealed the win. Appeared in 77 games, including 20 starts for the Wildcats…Averaged 4.8 points, 1.2 steals and 18.9 minutes during her Wildcat career…Played in six NCAA Tournament games…Reached double figures in scoring eight times…Scored a career-best 15 points versus Miami (Ohio) in 2010…Tallied 10 points, three steals and career-high seven assists against Jacksonville State in 2011…Appeared in 33 games as a freshman in 2010-11, averaging 6.2 points and making 11 starts…Played in 34 games, including five starts, during her sophomore year in 2011-12…Her junior season in 2012-13 was cut short by a knee injury after just 10 games. 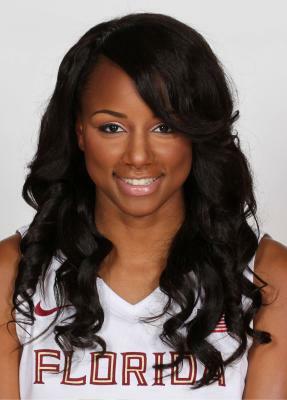 A four-year letterwinner and a three-year starter at Timberview High School…Led the Wolves to a 39-2 record and a state title her senior year, averaging 15.5 points, 4.5 steals and 3.0 assists and capturing 2010 Ft. Worth Star Telegram Girls Player of the Year and 2010 Texas 4A State Tournament MVP honors along the way…Ranked the 35th-best guard in the nation by ESPN HoopGurlz in 2010 and was a McDonald’s All-American nominee and a MaxPreps Girls Basketball All-American honorable mention…An all-state and all-region selection…A three-time District 4-5A Most Valuable Player. Born June 4, 1992…Parents are Milton and Victoria Conwright… Majoring in Information Communication and Technology…Earned her first Bachelor’s Degree in sociology …Chose to attend Florida State because of the “great coaches and welcoming environment”…Favorite television show is Scandal…Favorite quote is “The only person I want to be better than is the person I was yesterday”…Favorite movie is Slumdog Millionaire…Favorite magazine is Sports Illustrated…Favorite song is “Latch” by Disclosure…Career ambition is to work in the information technology business…biggest hardship faced is suffering a season-ending knee injury as a junior at Kentucky in 2012-13…Played basketball, volleyball and ran track in high school…Will occasionally watch Love and Hip Hop on VH1…Likes to dress sporty and girly, saving her sporty look for the weekdays and girly on the weekends…Closest celebrity look-alike is Ciara…enjoys playing sand volleyball with her teammates because it is a sport that isn’t played much in Texas…Must eat either pasta or steak before a game as part of her routine…Says she owns at least 40 lotions and perfumes…Favorite home-cooked meal is fried chicken…Has two siblings, including a sister who played basketball at Stephen F. Austin.